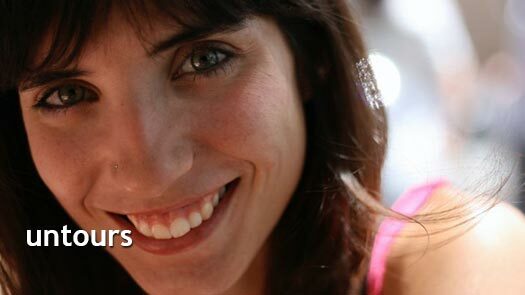 Meet Adriana, our local Untours staff representative on the Barcelona Untour. She is a great resource for our guests in Barcelona, resourceful, smart, full of city knowledge, and quick with a friendly smile. Like so many of our European staff members, Adriana has a fascinating background and a very rich professional life beyond her work with us. I love traveling and I do it all the time. It’s amazing, being back home, to be able to explain details of my city (and my favorite one) to those who love doing the same thing! I was born in Barcelona and hold a BA in Media and Communication Studies from Ramón Llull University (Spain) which I combined with my acting studies. When I finished (2005) I left to the United States where I studied for a Certificate Program in UCLA (Los Angeles) on Film, TV and Digital Entertainment. There I realized how important it is to meet other cultures and people from around the world and I started traveling all around (Cambodia, Vietnam, Thailand, Nicaragua, India, Mali…). These trips were what laid the foundations of my current professional and personal interests, which are intertwined. Back from LA, I moved to Mallorca (Spain) and worked as a journalist for almost 4 years on a local TV station. I decided communication (for which I consider myself gifted) was my perfect tool to share those things I found interesting, personally and professionally. Realizing how important it is to make people aware in order to rouse, inspire and mobilize them, I decided to add a political background to my education and I completed a postgraduate course in Political Science. During that period I decided to travel to the Saharan refugee camps in Algeria to take a course in communication and photography. Additionally, my writing skills are good and I see myself as a creative person who always tries to emphasize the uniqueness of each project / initiative. In 2011 I decided to leave Mallorca and before landing in Barcelona I went to India to shoot a documentary about the work done by a Spanish NGO (SRAMPUT) which supports education for the poor. The last stop was Bamako (Mali) where I collaborate with the NGO Voces. That was a big opportunity to meet African reality and absorb a really different culture. The inspiration was huge. Meeting such poverty makes you reconsider life, values and principles. Back to Barcelona (2011) I wanted to mix my communication skills with international work, so I started a Master’s Program at the Institute of Barcelona of International Studies (IBEI) in International Relations. Now that I’m settled again I created a Theatre Production Company with some friends and we are currently performing our first project If there is I haven’t found it yet in Sala Beckett (a nice theatre in Barcelona). For the theater company, I work as a producer. I am always excited about new challenges and I love international experiences. The trips I have taken and the education I hold are connected almost by chance but it did draw a life path I really want to keep following. Let Adriana show you the best of her beloved city on a Barcelona Untour.